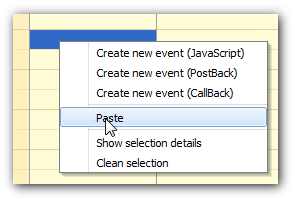 This sample shows how to implement a copy & paste functionality using context menu in the Calendar control. 1. Add a global variable that will hold the id of the copied event. 2. 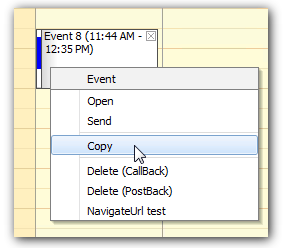 Add a "Copy" command to the event context menu (ContextMenuID). This menu item will store the ID of the selected event in the "copied" variable. This menu item will execute Command event on the server side, using "paste" as the command, and sending the ID of the copied event under the "id" key and the selected time start under the "start" key. 4. Handle the Command event on the server side. Create a new event from the copied one.